Danny O’Brien took the opportunity to let Embrace Me have another feel of Moonee Valley on Monday ahead of Friday night’s Group III Typhoon Tracy Stakes. Embrace Me galloped on her own over 1000m and was strong in the straight, keen to go faster and running her last 400m in 24.88 seconds. The daughter of Shamexpress is nominated for Friday night’s Group III contest for three-year-old fillies over 1200m and O’Brien is anticipating a forward showing. “She’s a big strong filly and in good form,” O’Brien said. “I was very pleased with the way she worked this morning and she deserves a shot at a good race. O’Brien also had Second Bullet gallop at the Valley on Monday and the veteran is in flying form, galloping over 1200m and completing it with ease. 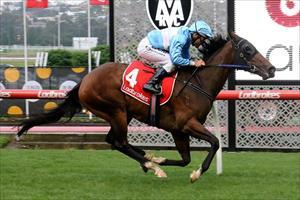 “We’re intending to send him to Tasmania for the Launceston Cup on Wednesday week,” O’Brien said. “I’m very happy with him and how he has come through his racing over the summer, he’s happy and fit and racing in career best form.